Born on February 26, 1846, William F. Cody, the man, became Buffalo Bill, the superhero, in the nearly 2,000 dime novels published during and after his lifetime. As vividly illustrated on their covers, Buffalo Bill confronted ancient evils, unusual villains, and situations no ordinary mortal could manage. This helped lay the groundwork for Superman, Batman and many other superheroes that would come later. On Sunday, Feb. 26, 2012, the Buffalo Bill Museum and Grave will open a new special exhibit entitled “Buffalo Bill Super Hero” as part of its annual observance of Buffalo Bill’s birthday. The annual birthday celebration will begin at noon with the singing of “Happy Birthday” to Buffalo Bill, led by an entourage of look-a-likes. Then free cake and ice cream will be distributed to everyone present. Between noon and 4:00 pm, the event will include a Buffalo Bill and Annie Oakley super hero costume contest as well as a buffalo chip throwing contest and other party activities. The museum, including the new “Buffalo Bill Super Hero” exhibit, will offer FREE admission throughout the day. During his lifetime William F. “Buffalo Bill” Cody became a living legend. He was a product of the vanishing West; a genuine hero who built a show business career on his experiences. But much of his legend was the result of the many stories, mostly fictional, written about him. The early pulp fiction about Buffalo Bill laid the groundwork for the superheroes of the comics that came later. Like Batman he performed extraordinary feats aided by the technology of his time. Like Spiderman he confronted clever villains and strange creatures. Like many of the later superheroes he even had a costume. 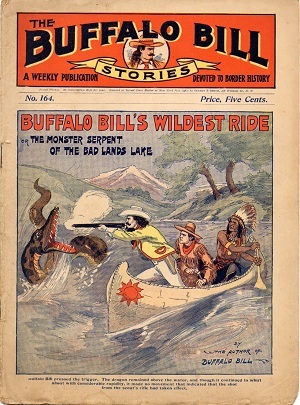 “Buffalo Bill Superhero” will feature selections from a collection of 800 dime novels given to the Buffalo Bill Museum and Grave in 2011. It will explore such themes as the ghostly villains, strange creatures of the West, and near death experiences confronted by our hero Buffalo Bill, all illustrated by the colorful covers of period dime novels and magazines. The exhibit will run throughout 2012, closing in January of 2013.